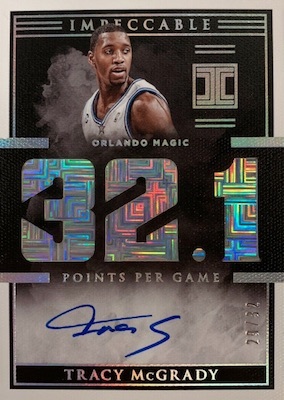 The third season for the expensive NBA set, 2018-19 Panini Impeccable Basketball aims to live up to the high-end billing with an average of five autographs per box, plus one gold, silver or Stainless Stars metal insert. Just as with the 2017-18 set, on-card autographs are the name of the game. Collectors will only find hard-signed editions in '18-19. 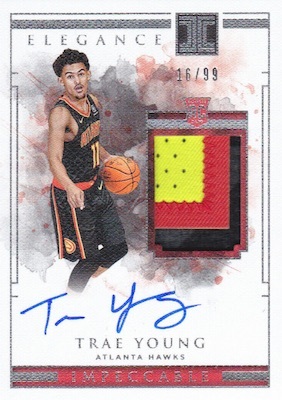 In addition to the expected three base cards, 2018-19 Panini Impeccable Basketball goes all-in with some metal inserts that combine to fall one per box. Most popular are the Silver (one troy ounce) and 14K Gold (1/2 troy ounce) cards. There is also the Stainless Stars line, which comes in the unsigned base edition, as well as Autograph, Autograph Gold (#/10) and Autograph Platinum (1/1) versions. 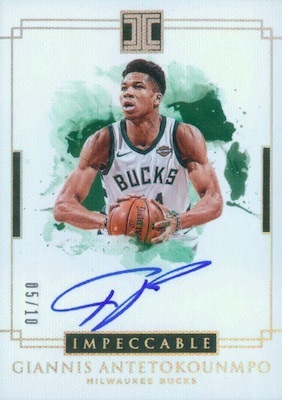 For premium autograph fans, 2018-19 Panini Impeccable Basketball features the hard-signed Elegance Jersey Autograph set that covers rookies, veterans and retired players. These are numbered to 99 copies or less, including the Holo parallels. 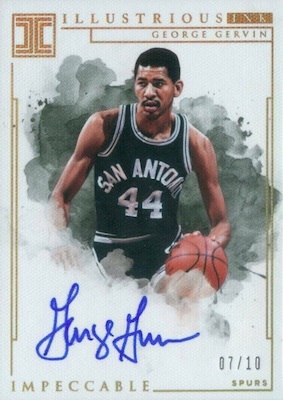 Specific to the player's milestones, statistics, or actual jersey number, additional on-card choices include Assists Autographs, Championships Autographs, Jersey Numbers Autographs, Points Autographs, Rebounds Autographs, and Stats Autographs. PARALLEL CARDS: Silver #/49, Gold #/35, Holo Silver #/25, Holo Gold #/10, Platinum 1/1. 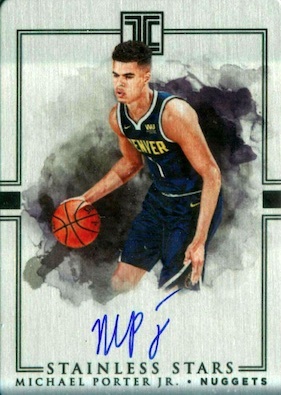 Buy 2018-19 Impeccable NBA autographs on eBay. PARALLEL CARDS: Holo Silver #/10 (Barkley #/5*), Holo Gold #/5 (Barkley #/3), Platinum 1/1. PARALLEL CARDS: Holo Silver #/10 (Curry/Durant #/5*), Holo Gold #/5 (Curry/Durant #/3), Platinum 1/1 (No Giannis*). PARALLEL CARDS: Holo Silver #/25 or #/10, Holo Gold #/10 or #/5, Platinum 1/1. PARALLEL CARDS: Holo Silver #/25 less, Holo Gold #/10 or less, Platinum 1/1. PARALLEL CARDS: Holo Silver #/25 or less, Holo Gold #/10 or less, Platinum 1/1. 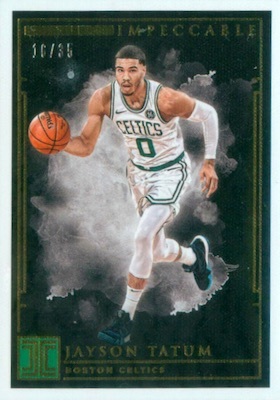 PARALLEL CARDS: Holo Silver #/25 or less, Holo Gold #/10 or less, Platinum 1/1 (No Giannis*). 15 cards. Serial numbered #/10. 50 cards. Serial numbered #/22. View the 2018-19 Impeccable Basketball checklist Excel spreadsheet. Steep, but great if you get good hits! 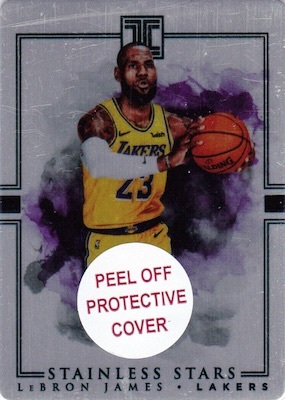 Do the metal auto cards also have a protective film on front and back? I bought of 2 cases on this one and I absolutely LOVE this product. Sure I can put this 2nd best overall for me due to the high price tag (my first currently is still crown royale) Here is why? 1) Design – simple and yet elegant. The whiteness of the product makes it classy and not cluttered. 2) Veteran player selection – good. The only ones terrible are Ernie DiGregorio. Enes Kanter, Junior Bridgeman. They should no longer be included in any Panini future products. They taint the product like donuts to your steak. The good thing is that at least there are many signers like from team base Lakers, Celtics, etc. Why not expand to champions teams like Mavs or Bulls. 3.) Autos – great. Nicely done. Each card from Impeccable are on card that is clean, crisp and classy. They are even than the National Treasure version. 4.) Collation – good. Balance on bad and good players. Some hits offset the bad ones making it worthwhile. 5.) 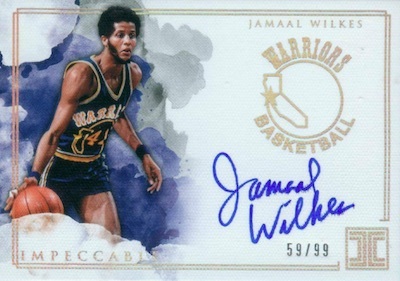 Hits – I got a Lebron James silver and Charles Barkley auto from first case then got Bagley metal card on the second case. Overall for $600 per box, I absolutely LOVE this product. Pricey yes, but they are worth it since the product is well done. This is an awesome product. Being a guy from Boston, I am grateful to have Boston centric players. 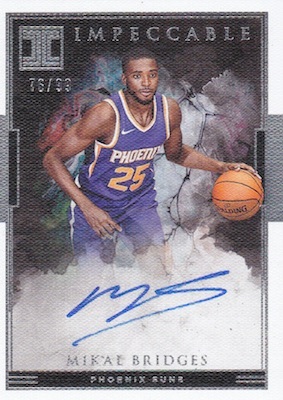 Was able to get a McHale numbers auto from my case but most of all I was able to get a Luka metal card too. Agree with taking out lower tier class D veteran signers out of this product. Veteran players averaging less than 10PPG career wise should not be included. 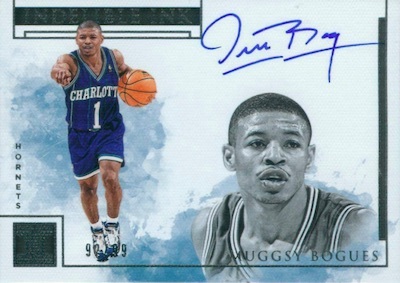 I reckon this product will go up in value more since imagine you pull an RPA of a Luka that is worth $3K. 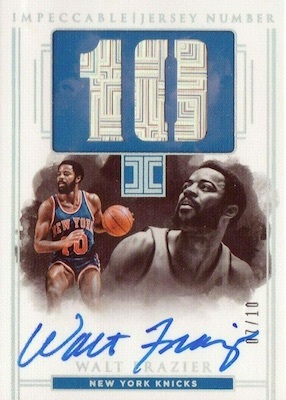 That is a key ON CARD auto rookie patch. Comparing previous National Treasure to this, I say this is on the top as the Most Prestigious product by Panini this season.